The Charles Eames DSR Chair is a timeless classic that will never go out of fashion. Our STIN design is a commemoration of the original and mirrors its style, quality and beauty. Moulded to the shape of the body, this STIN design is available in shiny fibreglass, matt and transparent plastic. The unique Eiffel tower legs are constructed from polished stainless steel. Like the original, our plastic version displays round markings on the seat. This is a natural result of the legs meeting the material. 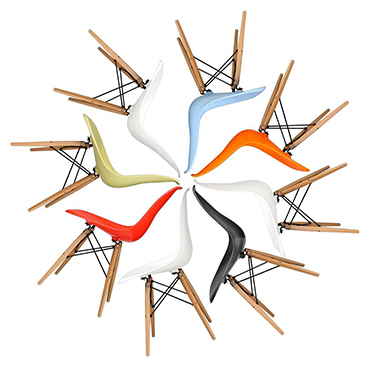 The Eames DSR Chair is available in several colours including black, white, green, red, orange and blue. Created in 1948, the Eames DSR Chair forms part of a series of moulded plastic chairs designed by husband and wife team, Charles and Ray Eames. Each one has the same ergonomically designed seat combined with different bases and arm styles. They are identified by their initials – for example, DSR stands for Dining chair, Side chair with a Rod base. This series of chairs has the iconic status of being the first industrially manufactured plastic chairs. Like its matching armchair, the Eames DAR chair, the Eames DSR Chair has deep seat pocket with a curved high back and waterfall seat edge to give increased comfort. Full satisfaction - super delicious in fiberglass .. Despite the 15-week wait time on the chair, I am super happy with it and it was protected / packed nicely into the cargo. With some skepticism I ordered 6 chairs - can only recommend them. New order has already been made. We were very excited to see our DSR-chairs, and we were pleasantly surprised. The chair looks like the "original" - design and comfort is top notch. Very nice chairs that resemble the original. Very happy that the chairs came earlier than they were promised. Beautiful chair and you sit really well in it.